Matt Crafton, driver of the No. 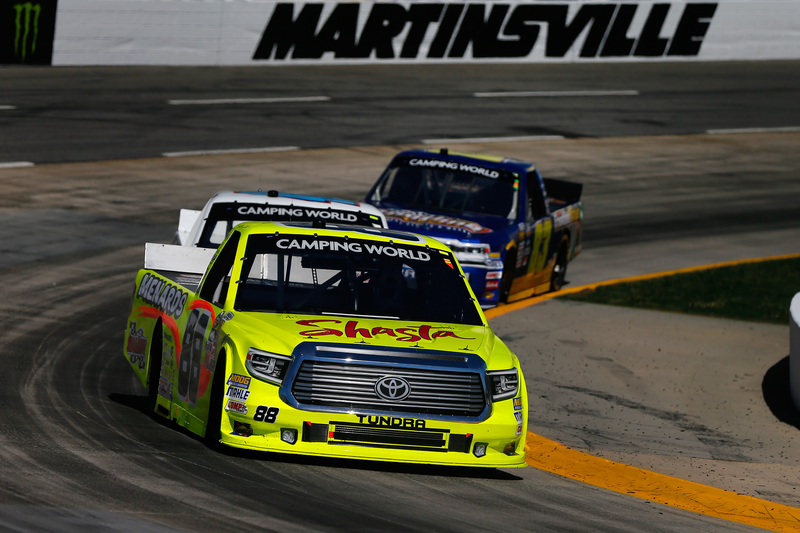 88 Shasta/Menards Toyota Tundra made his 31st career start at Martinsville (Va.) Speedway in Saturday’s NASCAR Camping World Truck Series (NCWTS) Alpha Energy Solutions 250. Starting fourth, the Menards driver showed his short track racing prowess through the 250-lap event, finishing third in Stage 1, second in Stage 2 and bringing home a ninth-place finish in the 36th annual event at the .526-mile track. a position inside the top-five through Stage 1. Running second, with three laps remaining before the conclusion of Stage 2, a caution flag was displayed, forcing the Stage to conclude under yellow. The No. 88 team opted to stay out, and benefit from the point payout for finishing top-10 in the Stage, while other teams opted to pit early for track position. Crafton would restart from the 14th position for the 101-lap shootout in the Final Stage. 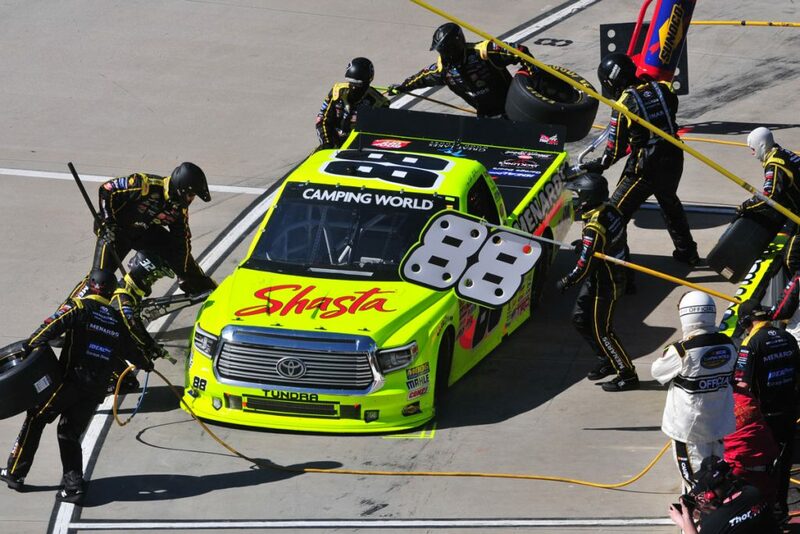 Unfortunately, contact with the 17 truck on the ensuing restart would force the ThorSport Racing driver down pit road at lap 176 to pull out the fenders on the left front of his Menards Tundra and change four tires. Restarting 18th, with 68 laps remaining, Crafton would muscle his way through traffic in the closing laps to cross the stripe in the ninth position behind race winner, Chase Elliott. The NASCAR Camping World Truck Series (NCWTS) had one practice sessions on Friday afternoon in preparation for Saturday’s Alpha Energy Solutions 250 at Martinsville (Va.) Speedway. Matt Crafton was sixth-quick overall in the 50-minute session. Saturday’s Alpha Energy Solutions 250 marked Crafton’s 31st career start at the .526-mile track. Starting fourth, Crafton ran as high as second, and finished ninth in the 250-lap event. In 31 starts at Martinsville Speedway, Crafton has one pole (2011) and has led 279 laps en route to two wins, eight top-five and 18 top-10 finishes. In three starts in 2017, the Menards driver has led three laps en route to one top-five (Atlanta), and two top-10 finishes. In 387 career starts, Crafton has 12 poles, and has led 2138 laps en route to 13 wins, 98 top-five, and 228 top-10 finishes. Crafton’s ThorSport Racing teammates finished 17th (Enfinger), 19th (Coughlin), and 20th (Rhodes). Up next: The Toyota Tundra 250 at Kansas Speedway on Friday, April 12 at 8:30pm ET on FOX Sports 1.